Destiny: Xur weapons, gear, and location, August 25 - 27. Trespasser and The Last Word! 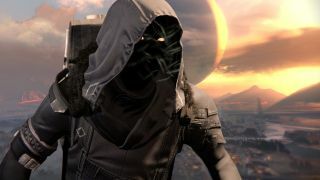 Xur, Destiny’s travelling weekend Exotic trader, in-demand medieval propmaster, and highly critical, Marvel Cinematic Universe essayist, is back. This week he’s in the Reef, having a bit of a rough day. He’s been at ths a long time, folks. Every Friday, always the same. Sometimes he’s not sure how much longer he can keep it up. Sometimes, on mornings like this, it feels like he hasn’t got more than a couple more weeks left in him before something has to change. What’s good? Well the Titans’ Taikonaut is a strong Exotic, if rather narrow of purpose, in that it delivers a whole barrage of buffs but all of them for rocket launchers. Target tracking, radar when scoped, bigger heavy ammo drops, extra super energy from heavy kills. The Taikonaut does all of these things, so if you like throwing lumps of metal out of pipes at high speed, you should check it out. As for Hunters, the Shinobu’s Vow gauntlets are also a good deal, if you’re a frequent Blade Dancer. Giving you an extra Skip Grenade for every charge, they’ll also make those grenades even better, upgrading their power and adding another tracker. And lo, Crucible Blade Dancers were even bigger jerks than before, but they did not care, for they were quite literally killing loads of people. As for The Ram? Also great. It adds the health-recovering Life Steal perk to all Voidwalker melees for free – ie. without having to sacrifice Soul Rip, which delivers extra super regen on melee – allowing you to combine both with Embrace the Void (which charges grenades on every grenade and super landed) in order to create an engine of near-total self-renewable power. Keep your melee ready with a high Strength stat – or even better, combine The Ram with Monte Carlo, to pretty much nullify your cooldown – and you have a hell of a powerful build. Competition for the title of Best Voidwalker Exotic has always been fierce between The Ram and Obsidian Mind, and will likely never be resolved. Guns? The Last Word is great fun, if not as powerful as it once was, due to a range nerf. On the plus side (and it’s a big plus side), it can be fan-fired, emptying a mag into a target in seconds. It also has increased hip-fire accuracy, and does extra damage on precision hip-fire shots. Clearly, this is now a weapon for spamming like a wild west gunslinger at close-range, and as a result, is something everyone should experience. Just reconcile yourself with reloading a lot. And Trespasser? Trespasser is brilliant. An Exotic sidearm, is fires faster than light, has solid stopping power, incredibly rapid reload, and makes bursts fired straight after reload even more powerful and accurate. It is a damnably efficient gun. As ever, Xur will be around until 10am UK / 2am PT on Sunday, at which point he’ll be away for another week. How many more weeks wait in his future beyond that, is a tally yet to be counted.